I was born in Sapporo, Hokkaido, to parents who were both chefs. They ran an Izakaya restaurant in Sapporo for 36 years, so I enjoyed cooking since I was a young child. At the age of 19, I started my career as an assistant director at the largest TV station in Hokkaido. 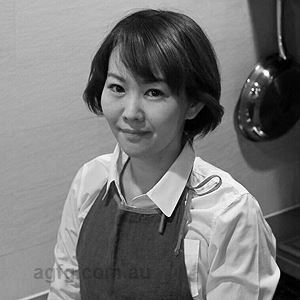 Several years later I became in charge of various cooking programs such as a Japanese version of Australia’s Master Chef, as well as many live cooking shows. I created all the menus introduced on these shows and when Chefs Kiyomi Mikuni and Mamoru Kataoka appeared on the shows in Hokkaido, I would help them introduce the menus. I am working on becoming an advisor for famous food companies and restaurants in Japan to create menus. Yes, since I was a child. Using the sweetness of fruits or honey instead of sugar. Umami from kombu (kelp). Hokkaido is an area famous for its Kombu and Umami is the Japanese fifth taste, its means savoury, so I enjoy finding different variations of Umami from other ingredients, especially vegetables. Farm to the table. It’s best to use local production for local consumption. I don’t speak English very well, so I enjoy communicating through my food. Hokkaido Style New Year dishes.